🎁 LAUNCH SALE: BUY 2 AND ENJOY FREE WORLDWIDE SHIPPING! ALL IN ONE PHONE HOLDER, LET'S GET YOUR IMAGINATION STARTED! The BTR® multi-functional lounger is an adjustable neck & platform mount that is perfect for any occasion. 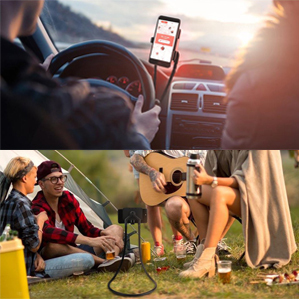 Bring it with you anywhere for an easy and relaxing phone/tablet viewing. It can be tucked into the headboard of bed or under the mattress, sitting on the desk or chair, strap it around your neck or chest, while you are watching videos, streams, face-timing, gaming, reading, cooking, cleaning or sporting at home. No more hand pain holding your phone! It is a wonderful gadget for when you are traveling. 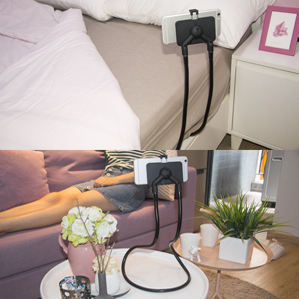 You can strap it around your steering wheel in cars, or put it on the front desk on planes, it also can be used as a selfie stand, or recording your own videos outside. Gives you a hand in life! Item arrived on time and consistent quality and description! Exactly as described. Very comfortable around the neck. The shipment came in 12 days after ordering. Holder is great! It serves what is intended. Very good bendability. I recommend buying. Fast shipping. Great holder, very convenient. Can be used as for tablet and mobile. Adjustable for any device. Very happy with the order. Thank You!!! Good sales! Just what you described, very useful for when you have discomfort on the hands. Cool! Very useful and serves for phone Large!! Many thanks!! !